Opening ceremony – having mastered the tram system during our training week here, we set off early for the opening ceremony, and stopped off at the great gelato place in the main town square, then wandered down to the ceremony location. It was a fairly rainy evening, so we also took jackets and the little orange pads they gave us to sit on, which turned out to be quite a good move as the evening got colder. The ceremony was in Czech and English and there were a few short speeches before the team parade across the stage (Gene was our flag bearer), as well as some small children singing and a couple of appropriately awkward dance routines, followed by quite a cool orienteering light display projected onto the wall of a nearby building. We trammed home again and prepared for the sprint relay in the morning. Laura (1st leg) – Starting in the mass start was fantastic fun. The first 2 controls varied quite a lot amongst the runners, so I found that I was running by myself for the first part of the course. I had the unique experience of reaching the turnaround control (#6) in first place!!! Turning around to see the line of runners behind me was so exciting but made me lose concentration resulting in me running through a giant patch of above-knee stinging nettles, rather than following the path I’d just run along. I finished in 11th place, about 1.20mins behind the leading Swiss runner. Gene (2nd leg) – Before the start I was feeling quite relaxed and I started calmly. I didn’t understand the trees around my first control and I was really confused leaving this control. I sorted myself out but lost about 30 seconds running too far to the right and stopping to relocate. There were a lot of people running around in front and behind me at the stage as the splits were very significant. I sorted myself out and got back in the zone and ran pretty clean through the rest of the park section up to control 10. However, analysis shows that I lost some time by running too much on the grass and not enough on the paths. The Final five legs were very simple and I ran past a runner from Ukraine and finished in 11th. Tessa (3rd leg) – I started in 11th place a minute behind Canada, and about 30s ahead of a group including Spain, Italy, Estonia, Poland, and Ukraine. I made few mistakes, but just didn’t have the speed for this type of race, which was unsurprising given the major interruption to my build up. There was a lot of stinging nettle in the park, then the buildings part was on cobblestones. The forking was quite different to in the test race (where all four controls were within 100m), and created quite different courses for everyone. 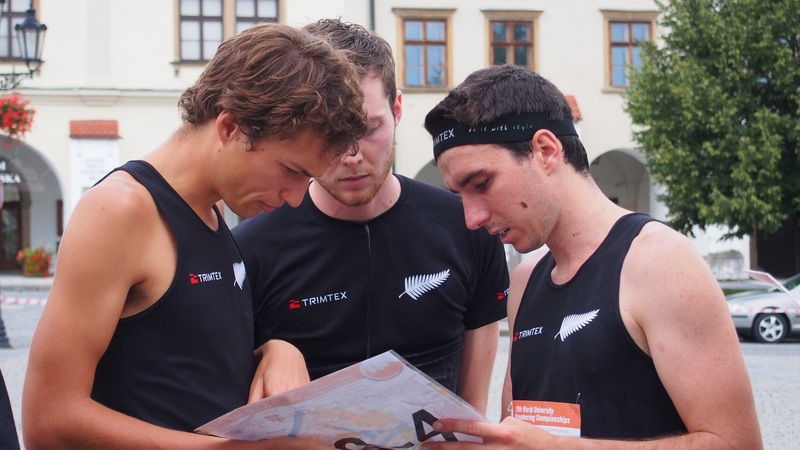 Overall I was happy with my race – I lost about a minute across the whole course to the group who started just behind, which dropped us to 16th place, but I caught the Canadian and kept us in the race for Matt on the final leg.